In situ hybridization is now widely used to identify the nature and size of chromosome, chromosome arm and chromosome segment introgressions from alien or wild species in plant breeding lines. The molecular cytogenetics research group has several projects investigating introgression of chromosomes into wheat from rye, Thinopyrum (2x and 6x), Aegilops and other species or genera. We aim to track the alien segments through breeding programmes, assist with selection and characterization, and often minimize the segment size to avoid deleterious genes being carried into the wheat (linkage drag) from the wild or alien species. We are also continuing to develop the technology to make detection of alien segments more precise and to complement molecular marker approaches. The picture shows the RAGT variety of wheat, Gladiator, carrying an introgressed chromosome arm from rye. 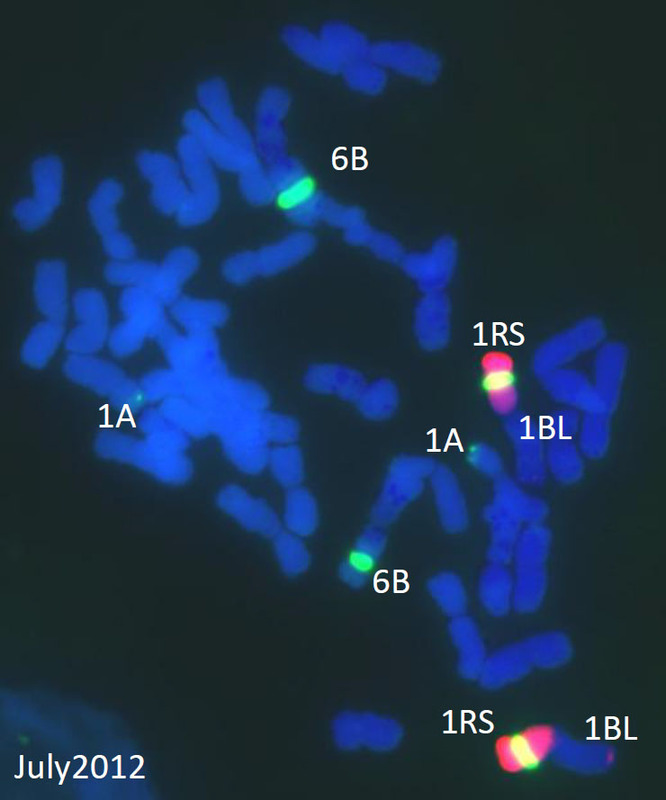 The root tip metaphase chromosome preparation with 42 blue, DAPI-stained chromosomes, is imaged after fluorescent in situ hybridization with total genomic DNA from rye detected by red fluorescence, and the 35S rDNAclone pTa71 detected by green florescence at the Nucleolar Organiser Regions (NORs). Chromosomes are counterstained with DAPI and wheat chromatin fluoresces blue. The translocated chromosome 1BL.1RS is identified by the red short 1RS arm bearing a yellow signal (red plus green) at the NOR and a blue fluorescing long 1BL arm. Chromosome 6B is identified by a strong rDNA signal on the short arm and chromosome 1A by a smaller signal at the end of the arm. The stickyness of the dough from the protein genes on the 1RS chromosome arm means that the translocation is now only found in a few biscuit and feed wheats, Gladiator, released in 2004, has been valued as a consistently high yielding wheat combining good standing and robust disease resistance. This entry was posted in Research and tagged alien, bread, breadmaking, breeding, cereals, chromosomes, comparative genomics, crops, DNA, genes, hybridization, in situ, in situ hybridization, labelling, Leymus, metaphase, microscopy, plant breeding, quality, repetitive DNA, rye, Thinopyrum, wheat. Bookmark the permalink.